TV show dates: August 31, 2018 — present. Performers include: John Krasinski, Wendell Pierce, Abbie Cornish, John Hoogenakker, Ali Suliman, Dina Shihabi, Amir El-Masry, Peter Fonda, Mena Massoud, Timothy Hutton, and Al Sapienza. 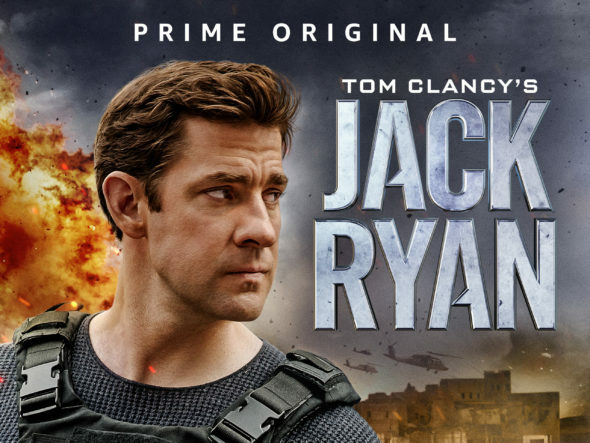 Based on the Tom Clancy character of page and silver screen, the Tom Clancy’s Jack Ryan TV show comes from creators Carlton Cuse and Graham Roland. The political action thriller follows Jack Ryan (Krasinski), a former US Marine who is now working as a fledgling CIA analyst. . The drama series kicks off with Ryan spending his days behind a desk, analyzing suspicious financial transactions. Along with his boss, James Greer (Pierce), Jack follows the financial trail to Syrian-based terrorist Mousa Bin Suleiman (Suliman), who is responsible for a ghastly attack in Paris. With help from Dr. Cathy Mueller (Cornish), a government epidemiologist, and Hanin Suleiman (Shihabi), the suspect’s wife, Jack rises to the occasion as he races to stop a planned attack on US soil. The limited series is an updated reimagining of the fictional hero’s early days as a CIA operative. Krasinski, a veteran of The Office (US), is the fifth actor to play the action hero, following Alec Baldwin, Harrison Ford, Ben Affleck, and Chris Pine. What do you think? Do you like Tom Clancy’s Jack Ryan TV series? Should this Amazon TV show be cancelled or renewed for another season? Please continue this Series! I have watched it multiple times and enjoy the story line and the acting! Please renew immediately if you value my recommendation! Thank you! are you kidding ?? Renew ASAP !!!!!!!!!!!!! Great show. My wife and I hope it will continue in a 2nd series. My husband and I just finished the first 8 episodes. We both love it and look forward to more! Great show! I look forward to another series with John Krasinski. I thought he was great! so far so good. nice feel to it. Clancy is a hard act to update or follow. real rivet and nut writer.